One the biggest concerns regarding the common use of Bitcoin as a form of payment is the safety of transactions. A lot of people, including government agencies, find it hard to trust the Bitcoin transfer system (Blockchain), which is mostly web-based. And their fears are justified to some extent. Malicious people with IT knowledge may hack the online Bitcoin wallets and consequently steal other people’s Bitcoins. To prevent this, companies have come up with offline wallets that store cryptocurrency keys and enable holders deposit, withdraw and send cryptocurrency without the need of an internet connection. One such wallet is TREZOR which we are about to conclusively review in this article. TREZOR is an offline wallet that allows you to store your private keys safely offline and enables you to complete Bitcoin transactions whenever you want, wherever you are. Think of it as a credit card for Bitcoin. The device, which is quite small in size, is connected to a computer through a USB cable which is also used for charging purposes. TREZOR was developed by upcoming Czech software company Satoshi Labs and released in 2014 as the first ever offline Bitcoin wallet in the world. The revolutionary device is currently receiving stiff competition from newer offline safes such as Ledger Nano and KeepKey although it still remains the most popular offline Bitcoin wallet. One of TREZOR’s standout features is the Password Manager which replaces the online master password with an ultra secure and encrypted access key installed in the device. This effectively makes it impossible for hackers, or anyone else without your permission, to access your account. Another thing about TREZOR that you might like is the fact that you can store several cryptocurrencies at once and still be assured of high level security. Apart from Bitcoin, other currencies supported by TREZOR are DASH, Litecoin, Ethereum and Zcash. The 5 currencies are arguably the most popular cryptocurrencies right now and most people are bound to possess at least one of them. How much does TREZOR Bitcoin Safe cost? The device is quite expensive for the ordinary folk which is a big letdown considering its limited features. Currently, TREZOR goes for $139.99 on Amazon. TREZOR devices can also be bought directly from the company’s online shop (trezor.io). The TREZOR e-shop accepts both credit card and Bitcoin payments, while Amazon only accepts credit card or bank payments. Note that it is illegal and strongly not recommended to buy the TREZOR Bitcoin Safe from any other website except the listed, particularly eBay. We would also not recommend eBay or similar sites when you want to buy sensitive devices, such as Bitcoin safes. You can use TREZOR on Windows, Linux and OS X computer platforms. Mobile phone users also have a reason to smile as recent changes by the developer enabled TREZOR to be compatible with Android and Windows devices. TREZOR keeps your coins safe and away from hackers and other unauthorized people at all times. It will never expose your private keys to anyone. What more, it keeps your info safe even when your connection is not secure and/or when your computer is attacked by malware. From the setting up to the actual transactions, TREZOR is as easy to use as your phone. You only need to connect it to your PC via the provided cable and log in to your account. It comes with only 2 buttons, one for rejecting/denying transactions and the other for allowing transactions. Very basic. The biggest downside to TREZOR is that it is quite expensive and many people might be forced to look for cheaper options. And there are cheaper options, including Ledger Nano S.
To give you an idea of what it feels like to use TREZOR Bitcoin Safe, here’s a few comments from users in different forums on what they liked /didn’t like about TREZOR. As you can see, many people hold the device in high regard. That said, TREZOR has an impressive 4.2/5 stars rating on Amazon from 42 reviews which is a clear indication of its performance. Generally, most of the documented complaints about TREZOR have to do with the customer service, cost and the possibility of compromised security in case of loss or misplacing of the pocked-sized device. On the cost, the developers need to do something about it or risk losing customers to cheaper options. On customer care, we cannot complain since we were served all right and had our questions answered on time. Finally, we don’t see how one can possibly lose the device unless you keep carrying it around with you in which case you need to be extra careful. TREZOR is undoubtedly the best Bitcoin safe in the market and will continue to be for a long time. It’s a great way to keep all your Bitcoins safe and your transactions simple and fast. Thanks for reading our TREZOR Bitcoin Safe Review. If you enjoyed this review, you might want to subscribe to ScamBitcoin.com to receive an email when we upload new posts. 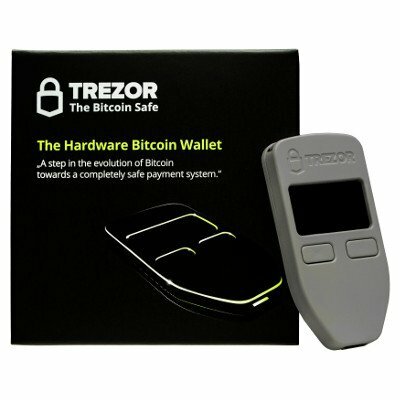 Please leave a comment below if you would like to provide any feedback regarding the TREZOR Bitcoin Safe. Feel free to visit our Bitcoin and Crypto Currency Wallet page for more information and reviews.